I went through plenty of dieting highs and lows when I was in high school (and beyond) - where I would bounce back and forth from "treating myself" to restricting everything I ate. Anyone else? When I was around 16, my mom found a recipe for some low-carb berry scones using frozen berries and oats, and it was one morning treat I just couldn't resist. Knowing they were "low-carb" made me feel a little bit better, but it was still a guilty pleasure to me - something I knew I shouldn't be eating. Thinking back to times like these, 10 years later, makes me realize just how grateful I am for the Paleo lifestyle. 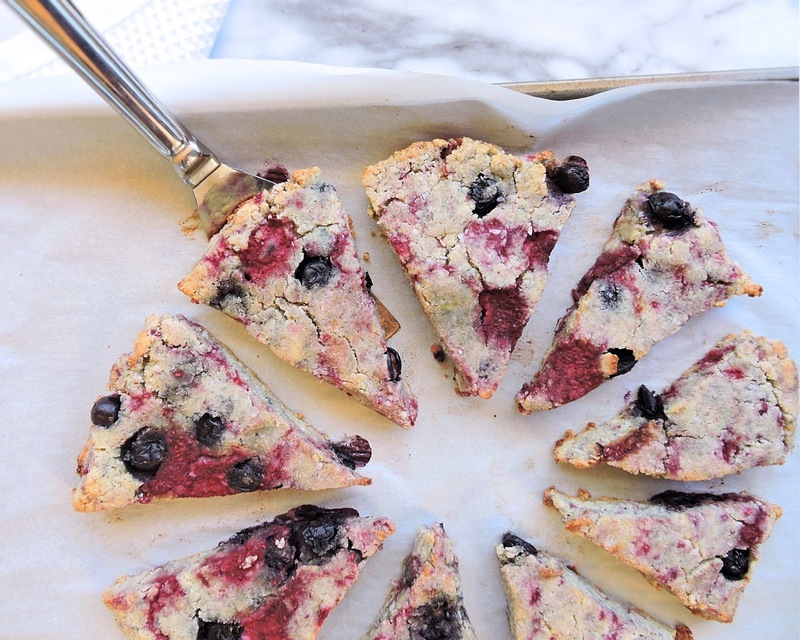 Because as long as I'm making things with real, whole foods that are good for my body, I can eat one delicious scone with breakfast (or even 2 or 3) and not feel like my day is ruined. My relationship with food is no longer an issue that makes or breaks me. 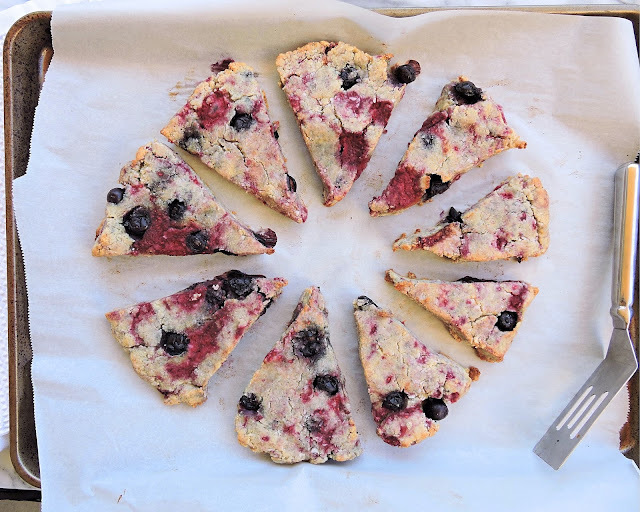 I love the texture of these scones~ the shredded coconut mixed in reminds me so much of oats! 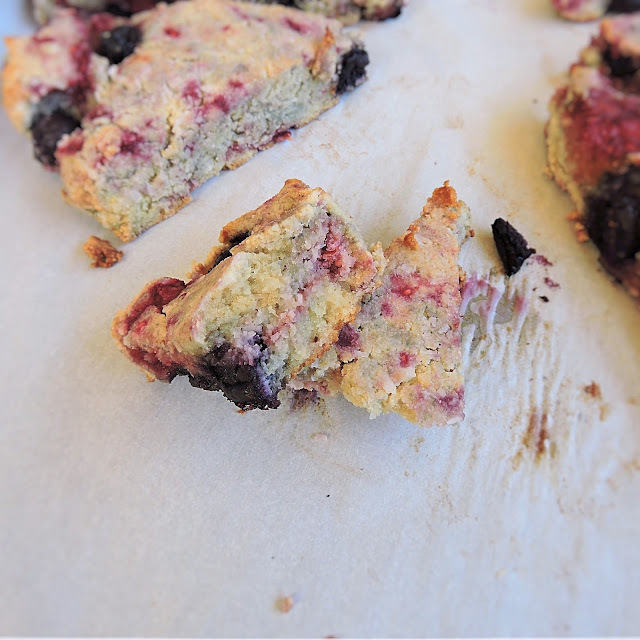 They're also dense like a scone should be, with a crispy outside; but the inside stays nice and soft & yummy. 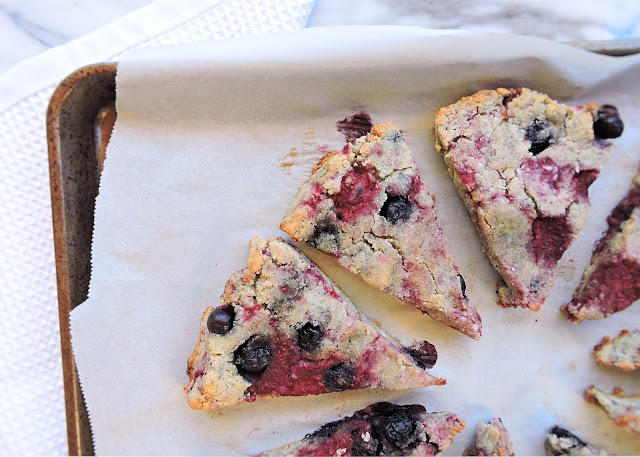 I love tossing in mixed berries for their different flavors from sweet to tart (frozen, cuz it's easy), but you could always stick with just one berry if you have a favorite! Enjoy one or three for me~ ours are long gone! Combine dry ingredients in a large bowl (almond flour, coconut flour, shredded coconut,baking soda, sea salt). Add the berries, stirring lightly to coat with the flour mixture. In a separate bowl, heat the coconut oil & honey or maple syrup until melted. Whisk in the eggs and vanilla. Pour the wet ingredients into the dry mixture, stirring gently until combined. Refrigerate the dough for at least 10 minutes to firm it up a bit. Transfer the chilled dough to a cutting board (or large flat surface) and press into a large, round shape about 1 1/2" thick. 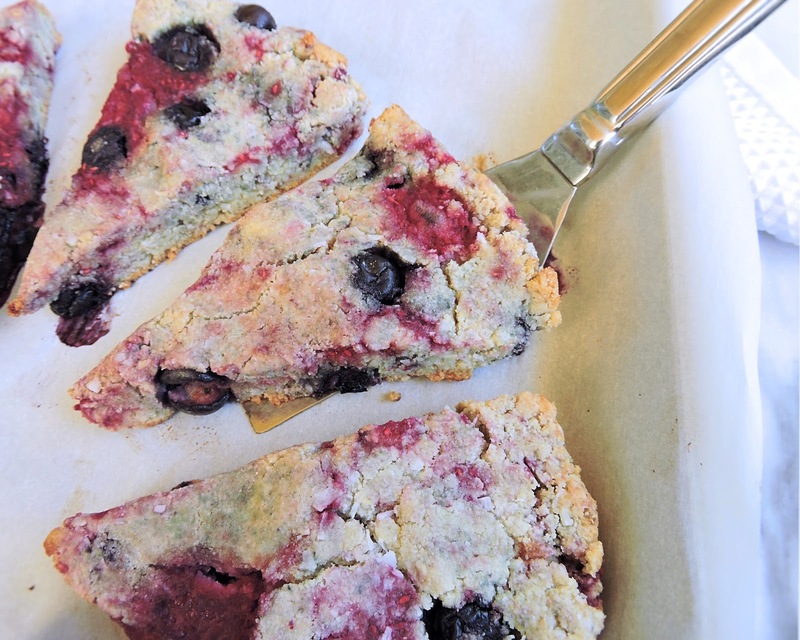 Slice into 8 or 10 pieces, and transfer to the parchment-lined baking sheet. Bake for 15 to 20 minutes, or until lightly browned on top. Thank you for this recipe! Paleo and pantry friendly. I'm going to test these out for an Easter brunch! Yummy! I think I have almost everything I need to make these! Thank you! Tracy, that made my day! SO happy your family approved! Thank you for the recipe. Really trying to eat paleo/clean and still have some treats. These look FABULOUS. It has become a trend to have low carb meals everyday, but is it actually right to cut down the carbohydrates from your diet totally?